Prince Harry and fiancee Meghan Markle have delighted crowds as they embarked on their first Royal visit to Northern Ireland as a couple. The Prince and his American actress wife-to-be have visited Lisburn and Belfast as part of a day of activities on Friday. In the afternoon the couple made their fourth and final stop on their trip at Titanic Belfast maritime museum. During the stop the couple met staff and locals, including six-year-old Lleyton and four-year-old Rosie Jackson from Ballygowan. During their first visit to Northern Ireland on 23 March 2018, Prince Harry and Ms. Markle visited the iconic Titanic Belfast. Press Eye - Belfast - Northern Ireland - 23rd March 2018 - Photo by William Cherry/Presseye During their first visit to Northern Ireland on 23 March 2018, Prince Harry and Ms. Markle visited the iconic Titanic Belfast. The Couple were guided through the venue’s interactive galleries, which explore the sights, sounds, smells and stories of RMS Titanic, as well as the city and people who made her. During the visit, they also heard about how the regeneration of the Titanic Quarter has provided Belfast with an exciting new urban space. Press Eye - Belfast - Northern Ireland - 23rd March 2018 - Photo by William Cherry/Presseye During their first visit to Northern Ireland on 23 March 2018, Prince Harry and Ms. Markle visited the iconic Titanic Belfast. The Couple were guided through the venue’s interactive galleries, which explore the sights, sounds, smells and stories of RMS Titanic, as well as the city and people who made her. During the visit, they also heard about how the regeneration of the Titanic Quarter has provided Belfast with an exciting new urban space. Pictured with Prince Harry and Ms. Markle are children Lleyton (6) and Rosie (4) Jackson from Ballygowan and staff member Ellen Fitzsimmons. 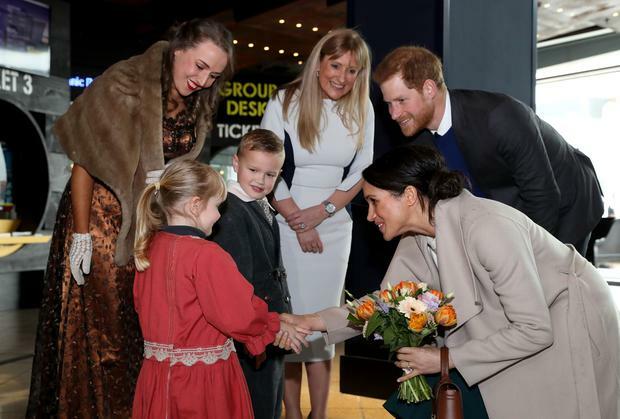 Judith Owens, Titanic Belfast’s Chief Executive, said: “From her origins as a Royal Mail Steamship, ‘RMS Titanic’ has always had a royal connection, and as such, we are absolutely delighted to welcome Prince Harry and Ms Megan Markle on their first official visit to Northern Ireland." 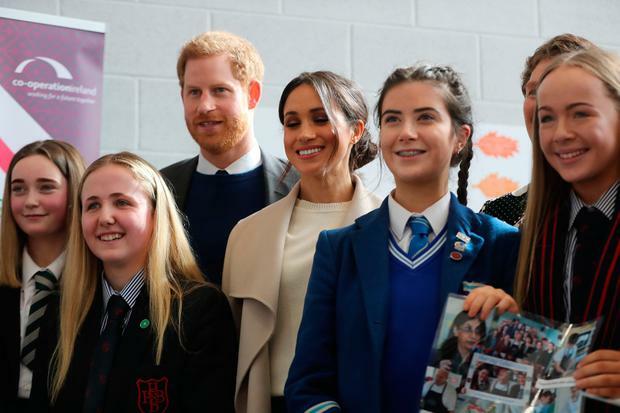 Harry and Ms Markle began their day at the former Maze prison site outside Lisburn where around 2,500 young people from both sides of the Irish border gathered for a peace-building event. They were greeted by Londonderry students Amber Hamilton, from Foyle College, and Ryan McCallion, from St Joseph's Boys school, both 17, before meeting a number of dignitaries including PSNI Chief Constable George Hamilton. The couple then had lunch at the Crown Liquor Saloon, Belfast's atmospheric Victorian gin palace which is filled with a wealth of architectural features and is a major tourist attraction. Harry joked with Heather McLachlan, the National Trust's director for Northern Ireland, asking "Are you open? ", before declaring "We want food". His fiancee added: "We saw the menu last week, and said 'We'll have this'." The couple marvelled at the pub, which features period gas lighting, a red marble-topped bar, mosaic tiled floor and snugs - ornately carved wooden booths with stained glass where Victorian drinkers could sit in private. Looking up at the ornate ceiling, Harry said: "It's amazing, it really is." The antique bell system that drinkers used to call staff still exists and may have been used by the couple to order their lunch of Irish stew in a snug. After dining the pair went walkabout outside the building to meet the people of Belfast. Arriving at their third engagement of the day, at a hub for young entrepreneurs, the couple waved at well-wishers who had braved the rain to catch a glimpse of the royal visitors. Inside the Catalyst Inc facility in part of Belfast's regenerated docklands, they were greeted by a number of dignitaries, including Lord Mayor Nuala McAllister and East Belfast MP Gavin Robinson. Harry and Ms Markle then met a number of innovators who are supported by Catalyst - a not-for-profit organisation aimed at nurturing new scientific ideas. Their day ended with a tour of Titanic Belfast which tells the story of the famous ship, from her conception in Belfast in the early 1900s, through her construction and launch, to the vessel's maiden voyage and infamous sinking. Some 600 guests will attend Prince Harry and Meghan Markle’s wedding at St George’s Chapel, Windsor Castle on May 19– with 200 joining them to party at an evening reception in Frogmore House.